The Blue Ocean, on the other hand, is the polar opposite of all of the above - as the authors of the Blue Ocean Strategy book (W. Chan Kim & Renee Mauborgne) put it: the aim is to "Create uncontested market space" in which to do business. Most people in keyword research and SEO are swimming with the sharks in the Red Ocean. It stands to reason: they're using the same techniques, the same data, and leveraging the same tools. And there's nothing intrinsically wrong with any of that, except that two people in the same niche, doing pretty much the same analysis are going to naturally put themselves in direct competition. So, the first message is an easy one: develop your own unique way of deriving value from the data. This is the point of an area of study known as Data Science. I recently read an excellent free eBook on the topic by Jerry Overton (a professional Data Scientist) -- Going Pro in Data Science -- in which the author explained how the key to success in data science was in picking signals out of the noise. Looking for patterns, in other words. Traditional SEO practitioners spend a lot of time telling is we need to look for patterns in order to chase the market. It makes sense on the face of it -- go to where the market is, and satisfy its needs -- but there's a slight problem. Online marketing is getting so saturated that the low hanging fruit in your niche may well have already been picked. Or worse still, it's become a red ocean of marketers all competing for the same space. Retailers suffer a similar consequence; they have to compete with each other, and online retailers. Even those in retail service -- restaurants, beauty salons and so forth -- will find that they need to adopt their own data science strategies to pick their market's minds, and develop strategies to exploit their competitive advantage. In fact, strategic management also tells us that there are resources that contribute to our competitive advantage that must be valuable, rare, difficult to imitate and organised in such a way as to make exploitation easy (VRIO analysis). Keyword research falls into such a category, but only if you develop your own data science to reveal the answers that you are looking for. After all, there's nothing rare or difficult to imitate about looking simply for the keyword phrase with the highest CTR, or the most search volume, or even with the least competition for space in the search engines indexes. Everyone is looking for those keywords, so even if the space is uncontested now, it's unlikely to remain that way for long! Luckily, most modern tools allow you to download your research data, so that different data points can be combined in a spreadsheet, and algorithms developed that let you organise, sort, and prioritise keywords according to your needs. 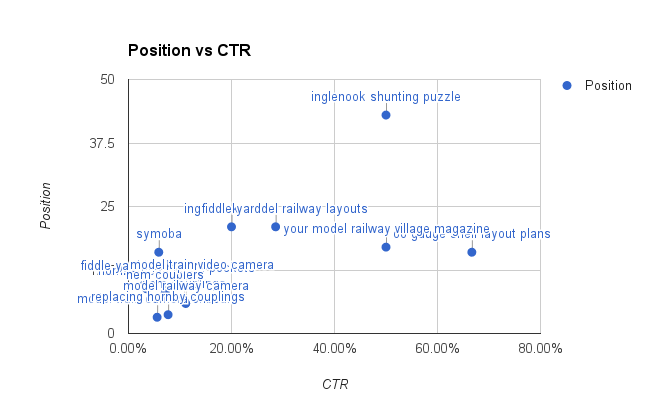 For example, you might download data from Google's Search Console (such as CTR and SERP data per query), and merge that in a spreadsheet with search volume data from the Keyword Planner, to enable you to perform analysis to reveal likely candidates for a new campaign centred around a keyword with certain distinct properties. Consider the following chart, for example. It shows something I call the 'outlier technique', where we look not for a pattern, but a signal from the noise of an existing pattern. In this case, the pattern is represented by a cluster of keyword phrases that fall into a clearly defined area, and a selection of keyword phrases that don't. These outliers show phrases for which something out of the ordinary is happening. The graph maps the SERP for each phrase against the CTR. The phrases in the bottom left, then, are those where competition is pretty stiff. This data is taken from the Search Console account for a client blog, so one of the first messages is that there are many instances where, despite appearing high in the SERPs, the CTR is low - not many people are choosing to click on the links, despite the entry appearing (on average) within the first three pages. There are many reasons for this, but in some cases its that the page ranks for a keyword which is not represented by the content (heading & summary) to a sufficient extent that the searcher is convinced that a visit is worth their while. At the other end of the spectrum, top-right of the graph, we have a phrase which, although it appears way down the SERPs, has a very high CTR. Either the content is very good, or the market is very hungry. 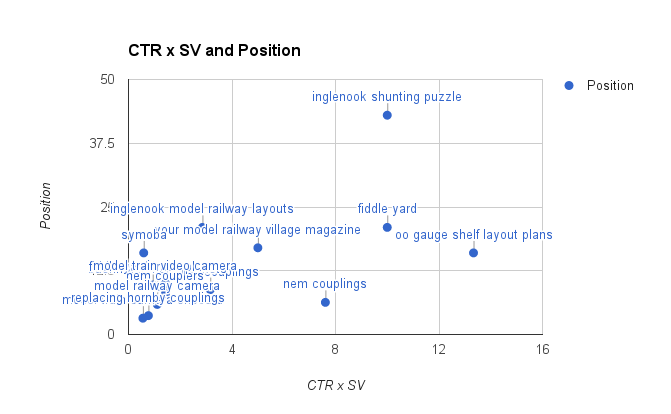 Both of these possibilities are worth exploring further: the next graph is a natural extension, and combines Keyword Planner data with the Search Console data, for the same set of keywords. With this iteration, we have more signals. This time, we have captured the available traffic, a simple multiplication of the volume by our CTR. It's a simple metric, but already we see that there are three phrases that show important characteristics that make them worthy of engagement for future products, publications or traffic attracting content. So, create your own metrics, and chase your own set of outliers, and you will be well on your way to making keyword research part of your own competitive advantage.